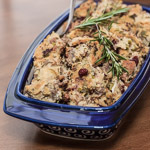 I’ve been trying to get my guys interested in Brussels sprouts for several years, and I’ve prepared them many different ways, but this is the first recipe that finally got Michael on board with sprouts. 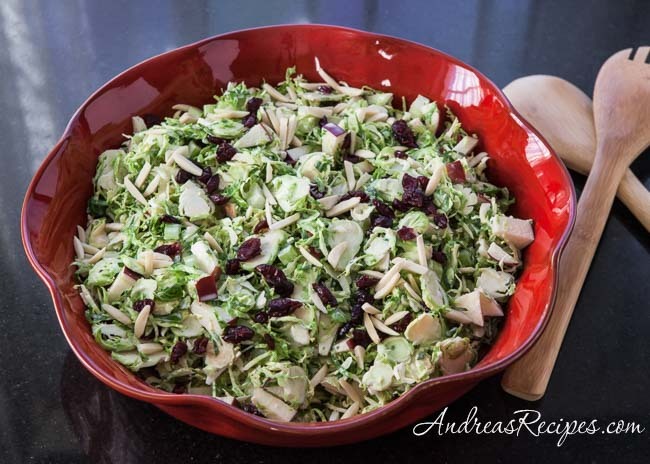 It’s a Cooking Light riff on the traditional Waldorf salad with shredded Brussels sprouts, celery, apples, and nuts. The boys dove right in, and Michael gamely tackled his bowl. After a few bites, he looked at me and said that this was the best Brussels sprout recipe he had ever tasted and that I could make this from now on. Score! Brussels sprouts are one of the healthiest vegetables in the brassica family, and have natural cholesterol-lowering and cancer-fighting benefits. The little cabbages taste excellent raw, lightly steamed, and roasted, and since they are in season they make a perfect addition to Thanksgiving meals. The Brussels sprouts shred quickly and easily in a food processor with a slicing blade. My version of the recipe uses low-fat plain Greek yogurt instead of the sour cream in the original recipe. 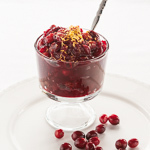 Plus I added dried cranberries for color and flavor, and substituted almonds because I didn’t have any walnuts on hand. I love toasted walnuts, but my guys aren’t so into them, so the almonds worked fine for them. 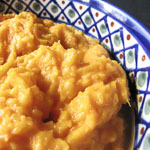 I’ve found that mixing the dressing first allows the flavors to develop and combine well before adding to the vegetables. Whisk the mayonnaise together with the Greek yogurt, apple cider vinegar, kosher salt, and black pepper. Allow the dressing to rest while preparing the vegetables. Run the Brussels sprouts through the food processor, using the slicing blade. 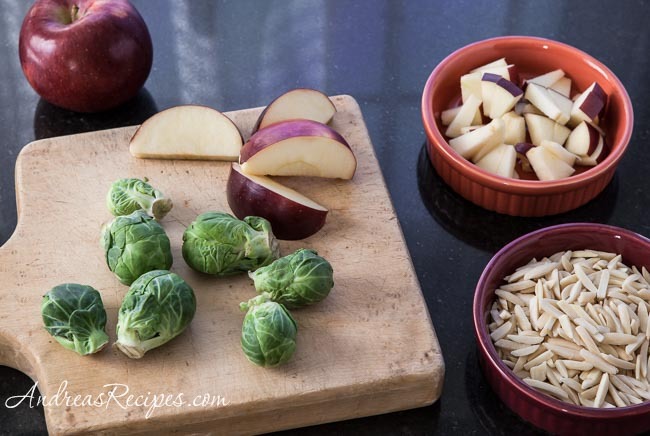 Transfer the shredded sprouts to the serving bowl, and toss with the apples, celery, and almonds. Drizzle the dressing over the salad and toss to coat, then serve. 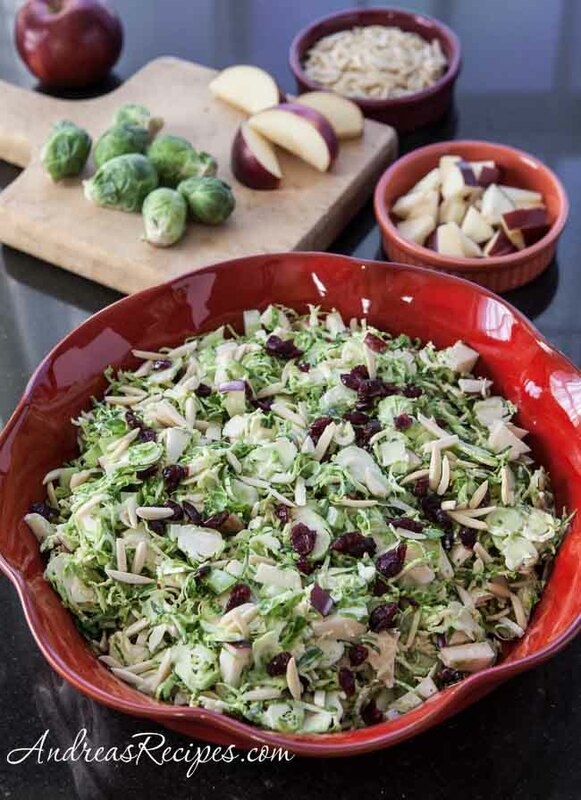 For make ahead prep, you can shred the Brussels sprouts, chop the celery, toast the nuts, and make the dressing the day before, then finish the rest and toss everything together just before serving.